We hope this will help in choosing the right lifting gear for your new up and over garage door. Canopy gearing system – the door panel runs vertically on tracks on the side frame with a spring assembly on the top of the frame. The panel will retract in to the garage by approximately two thirds leaving the remainder as a canopy. This gearing is ideally suited to manually opened doors so if you think you may want to add an electric operator at a later date then consider the retractable system. 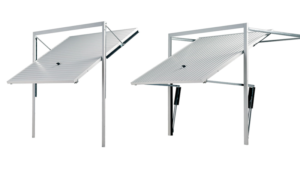 Retractable gearing system – the door panel opens on horizontal tracks which go back into the garage and are fixed to the ceiling or suitable side wall. If you want your door automated this type of gear has been designed specifically for use with an electric operator. This gearing is ideally suited to double sized garage doors. Our highly experienced Surveyors are able to advise you on the most suitable gearing for your needs and/or garage.